Side dish that goes with everything. These Mashed Potatoes With Creme Fraiche And Roasted Garlic are creamy and so flavorful. 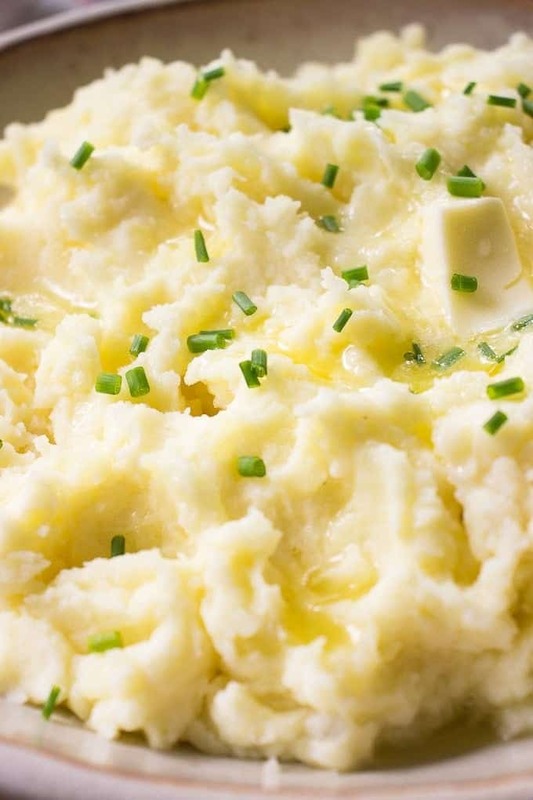 Put this recipe in your cookbook, it’s going to become your favorite mashed potato recipe ever! 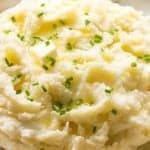 Say yes to easy-peasy, creamy-dreamy mashed potatoes with garlic that has been roasted to its perfect flavorful state. This is the kind of dish that I imagine having with my reader’s favorite Mustard Chicken, saucy Chicken Paprikash or that Thanksgiving turkey you’re making each year. This is also the kind of mashed potatoes that you scramble the last bits of it from the pot before throwing the pot into dishwasher. Because the more you have that creamy, flavorful goodness on your plate the better. 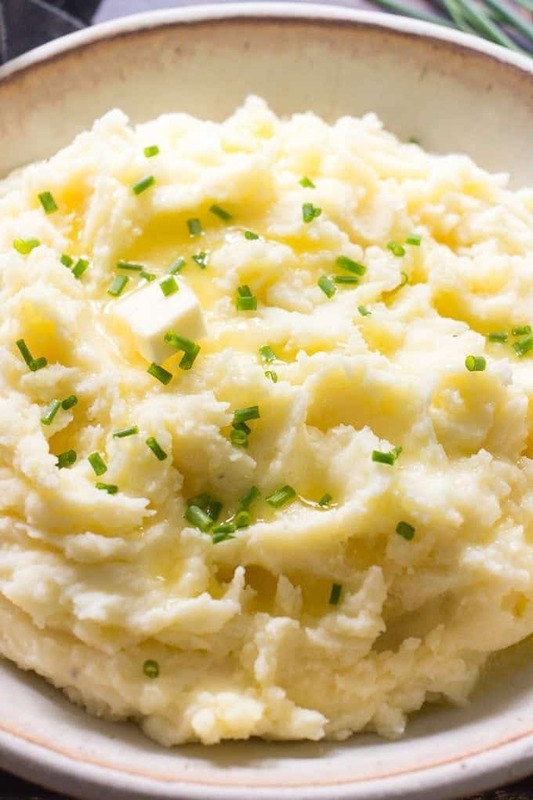 Every nation has their mashed potato recipe. 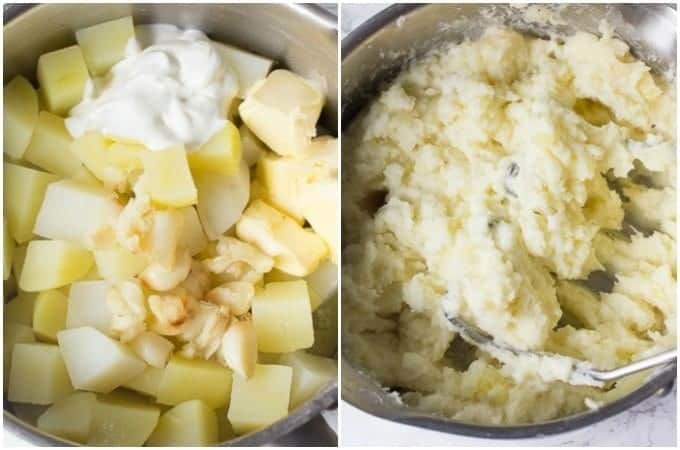 In Ukraine, we make it super simple and mash boiled potatoes with some butter and potato cooking water. Easy and delicious. The recipe that I’m sharing with you today has a French twist. Because I’m using Creme Fraîche, the ingredient found in many French dishes. You can find Creme Fraîche in pretty much any grocery store in the Dairy aisle. What Are The Substitutes For Creme Fraîche? If you don’t have Creme Fraîche, here’s a little trick, that I personally use quite often. Mix together heavy cream and sour cream in equal proportions. Quick “cheat” version of Creme Fraîche is ready. Cut the top off garlic head, leaving the cloves exposed, drizzle it with 1 teaspoon of olive oil and sprinkle with salt and pepper. 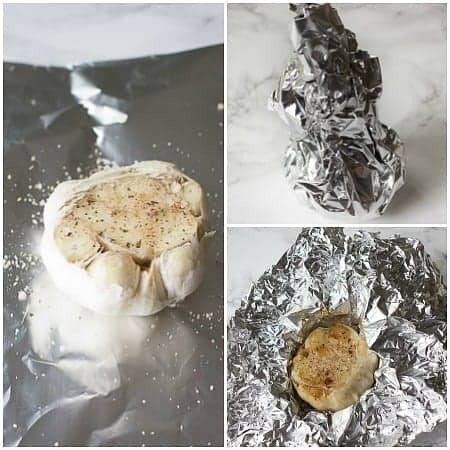 Wrap garlic in foil and roast for 25 minutes at 450 F.
Remove from the oven, unwrap the foil and let the garlic cool. 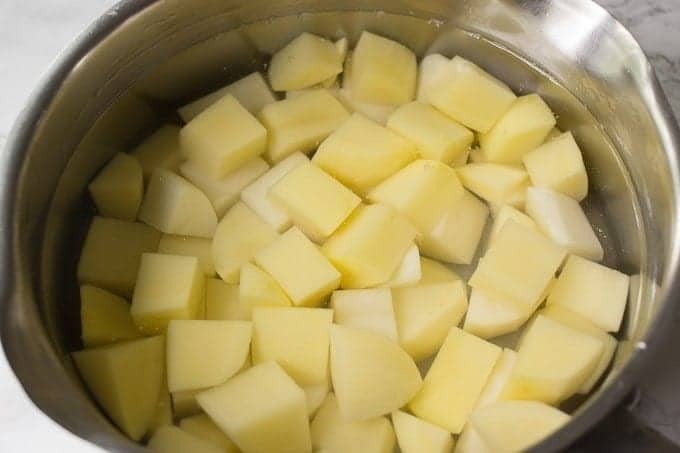 Fill a medium pot with water, add 1 teaspoon of salt and add peeled and cubed potatoes. Bring to a boil and cook for 15-20 minutes until potatoes are soft. For this recipe I used gold potatoes, but you can use red potatoes as well. Drain and return potatoes to the pot, then squeeze roasted garlic our of skins. Add Creme Fraîche, butter and using an old-fashioned potato masher, mash the potatoes until desired consistency. Drizzle potatoes with 1 tablespoon of melted butter, sprinkle with chopped chives and serve immediately. So flavorful and yummy! Can You Make Mashed Potatoes Ahead Of Time And Reheat? Absolutely. Make the potatoes the day before and store them in the fridge. Thirty minutes before serving, transfer mashed potatoes in the baking dish in an even layer. Add about 1/3 cup of liquid like cream or half and half to rehydrate the potatoes, loosely cover baking dish with a foil and bake at 350 F for about 30 minutes. If you have food thermometer, check the temperature of the potatoes. For safety reasons, it should be 165 F.
Garlic Mussels With Sour Cream Sauce – easy 15-minute recipe for shelled mussels. Cod Piccata – you have to try that creamy caper sauce! If you make my Mashed Potatoes With Creme Fraiche, snap a photo and post it on Instagram with a hashtag #lavenderandmacarons. I’d love to see your creations. 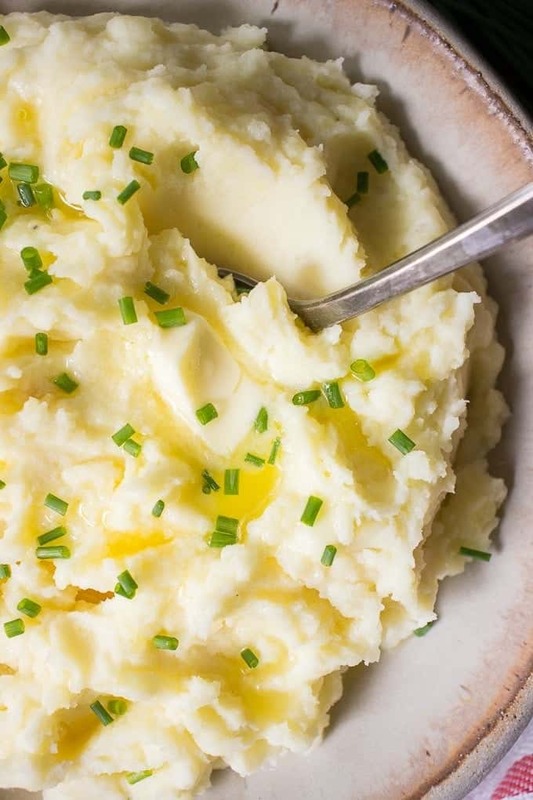 Creamy and incredibly flavorful, these Mashed Potatoes With Creme Fraiche and Roasted Garlic are the ONLY mashed potato recipe you need! Super Easy! Try it for yourself! Cut the top off garlic head, leaving the cloves exposed, drizzle it with 1 teaspoon of olive oil and sprinkle with 1/4 teaspoon of salt and pepper. Wrap garlic in foil and roast for 25 minutes at 450 F.
Fill a medium pot with water, add 1 teaspoon of salt and add potatoes. Bring to a boil and cook for 15-20 minutes until potatoes are soft. Add Creme Fraîche, 4 tbsp butter and using an old-fashioned potato masher, mash the potatoes until desired consistency. Transfer the potatoes to a serving bowl, drizzle with 1 tablespoon of melted butter, sprinkle with chopped chives and serve immediately.